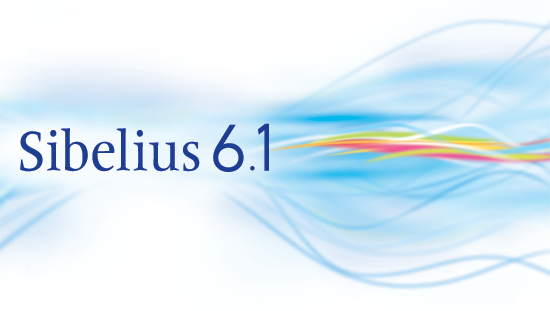 I’m delighted to announce that a free update to Sibelius 6.1 is now available, and existing Sibelius 6 users can update to the latest version to get a number of important improvements and fixes. Sibelius 6.1 also marks the release of the localized versions of Sibelius 6 in French, German, Spanish, Italian and Japanese, with their full launch set for Tuesday 20 October. …and much more besides. Plenty more details are after the jump, but if you want to jump right in, Sibelius 5 or earlier users can order their upgrade to Sibelius 6 here, new users can order a copy of Sibelius 6 here (or download the Sibelius 6.1 demo for Windows or Mac), and existing Sibelius 6 users can download the Sibelius 6.1 update here (or simply by choosing Help > Check For Updates from within Sibelius 6 itself). I plan to post in more detail about each of the most significant improvements in Sibelius 6.1 in due course, but here is an overview of each of them to whet your appetite. The improvement we’re most proud of in Sibelius 6.1 is undoubtedly the overhaul to magnetic slurs. Sibelius 6.0 already included the most significant improvements to slurs we’ve made since the original introduction of magnetic slurs way back in Sibelius 1.3 (ten years ago!). Slurs were given much better default shapes, improved default directions, and much greater control over their shape and contour by way of new handles, not to mention the many improvements with how slurs and articulations interact. You can see here that the accent at the start of the first slur is colliding with the slur, and the ascender of the flat symbol is very close to the slur arc, too. Meanwhile, the descender of the natural symbol is colliding with the second slur arc. Fixing these kinds of collisions is very simple (move the accent up a bit, perhaps raise the left-hand end of the first slur a tiny bit to give more room to the flat symbol, and likewise move the right-hand end of the second slur down a bit to avoid the natural symbol), but each of those edits takes a couple of seconds, and when repeated over the whole score that can add up. Besides, Magnetic Layout is designed specifically to put an end to these kinds of repetitious, fiddly edits. You can see that the accent has automatically moved higher to avoid the first slur, and the left-hand end point of that slur has also been raised slightly to avoid the ascender of the flat; meanwhile, the right-hand end of the second slur has been lowered slightly to avoid the descender of the natural. As with all other aspects of Magnetic Layout, magnetic slurs in Sibelius update in real time: unlike in some other notation programs, where you change the pitch of a note under a slur, and then have to fumble around re-selecting the slur to see the shape it has ended up, when you change pitch or add or remove articulations or accidentals, the slurs update in real time. Incredibly, you can even drag any of the slur’s handles in order to change its shape, and Sibelius will take that change into account and use it to influence the shape of the slur while it routes it around any potential collisions. This sounds odd, but wait until you try it to see how powerful it can be. And, as you would expect, there are controls in House Style > Engraving Rules that allow you to tweak the collision avoidance behaviour: for example, do you prefer slurs to get curvier rather than move their end points further away from the notes to which they’re attached, or do you prefer slurs to stay flatter and move their end points? You can change this balance, as well as determining how much gap should be left around slurs, via Engraving Rules. Naturally, if you don’t want Sibelius to change the shape of your slurs any further, you can use Layout > Freeze Magnetic Layout Positions to fix their current shape, or you can disable their magnetism on a case-by-case basis by switching off Avoid collisions under arc on the Lines panel of Properties. When we originally added playback of repeat structures including jumps such as D.C. al Coda and D.S. al Fine back in Sibelius 3, we canvassed our beta testers and various publishers who were at the time looking to use Scorch for playback of their piano vocal scores about what kinds of behaviours should be supported. At the time, those folks told us that after a D.C. or D.S. jump you would always take the last-time ending of any repeat structures between the point jumped back to and the jump forward to the coda or the Fine marking (as those of us who grew up playing minuet and trio movements of Haydn string quartets will remember very well), so that’s what we implemented. However, over the intervening years, one of the most commonly-asked support questions we have received has been about how to make 1st/2nd endings play after a D.C. or D.S. jump, so it turns out that certainly there is plenty of demand for the other convention, particularly in jazz and commercial music. It’s taken us a long time to address this because we needed to ensure that we didn’t break the playback of other repeat structures. We have used unit tests (which are a special kind of automated internal test) to check that the new behaviour doesn’t change the playback of other structures. So we decided to create a new dialog, Play > Repeats, to accommodate this new behaviour, which is also now the default in newly-created scores. To enable it for your existing score, simply choose Play > Repeats and switch on Play repeats after a D.C. or D.S. jump. While we were at it, we also added a new Manual repeats playback option, which allows you to specify the exact order in which the bars in your score should be played. So if you’re one of those folks who likes to save a page or two by creating structures with two or more codas, it’s now possible for you to get Sibelius to play your score back in that order, even though the automatic playback of repeats can’t handle that specific case. One word of warning: the bar numbers you enter in the Manual repeats playback box must be the internal bar numbers, which may differ from the bar numbers shown in the score if your score begins with a pick-up bar or if you use other bar number changes throughout. Each of these controls maps onto special functions in Sibelius. You can do obvious things, like control volumes in the Mixer using the sliders, and start and stop playback using the transport controls, but you can also do really sophisticated things. For example, you can use the soft-keys below the keyboard’s LCD display to switch the encoder knobs between controlling the pan of each staff in the Mixer to just controlling the extra parameters provided by some sounds in the Sibelius Player — and the names and current values of those parameters appear on the keyboard’s LCD display and update in real time. You can even use the numeric keypad to change note values on Sibelius’s on-screen Keypad, so you can use the Axiom Pro for step-time input without even touching your computer’s regular keyboard. Sibelius 6.1 introduces full, best-in-class support for the latest version of Garritan Personal Orchestra, GPO4, which uses Garritan’s new ARIA sample player. In addition to using the new ARIA player, GPO4 also includes new brass sounds from Project SAM, a new Auto Legato feature, improved built-in effects, and more. The coolest part of Sibelius’s support for GPO4 is that, just like with Sibelius’s built-in Sibelius Player, you won’t have to wait while progress bars appear on the screen as the sounds are loaded: in Sibelius, the ARIA player can load the sounds in the background, so you can keep on editing as you wait for the sounds to load, and by the time you’re ready to hear your masterwork, all you have to do is hit play! To use GPO4 in Sibelius 6.1, simply activate the ARIA Player in Play > Playback Devices, and when it appears in the right-hand Active Devices list, set the Sound set column to Garritan Personal Orchestra 4.0. You can mix and match sounds from different sound libraries very simply, so you can run GPO4 alongside, say, Sibelius Sounds Essentials or indeed any other library. To buy GPO4 now, head over to Garritan’s online store to buy the instant digital download. Live Tempo is one of Sibelius 6’s most interesting new features, and we wanted to broaden its horizons in Sibelius 6.1 by making it possible to use more advanced conducting techniques. In Sibelius 6.0, you can subdivide beats or beat e.g. once per bar without needing to tell Sibelius anything in advance: you can simply tap and Sibelius will follow you. However, on occasion you may want to tap in a particular way to indicate in an irregular way that would be difficult for Sibelius to interpret automatically, in much the same way as a real conductor might occasionally need to warn his ensemble about why he might indicate a specific bar in a particular way. Now you can do this in Sibelius 6.1 with the addition of tap points for Live Tempo. When you create a tap point, Sibelius will expect you to tap at that particular point, and will wait for you there until you tap. You can create tap points individually by simply clicking in the Live Tempo display, or using the rhythm of the notes already present in the staff using the new Play > Live Tempo Tap Points dialog. If you’ve already tried Live Tempo and found it didn’t quite work as you expected, give it another try now using the new tap points feature. One of the more subtle improvements in Sibelius 6.1 is the overhaul of the keyboard shortcuts used to navigate between notes. We made these changes after discussing navigation around the score with Dan Rugman, the author of the amazing Sibelius Access tools for partially-sighted and blind users. As is usual with accessibility-driven improvements, the resulting changes are actually beneficial to all users. If you currently use Alt+up/down arrow to hop the selection between staves, you will have a bit of re-learning to do: the Alt+up/down arrow shortcut now only moves between notes in the same chord; to select a note on the staff above or below you should use Ctrl+Alt+up/down arrow (Opt–Command-up/down arrow on Mac); and to change the selection to the next voice on the same staff, use Shift+Alt+up/down arrow. This new set of shortcuts is much more consistent and useful than the old Alt+up/down arrow behaviour, which ended up being very unpredictable. We have also improved the behaviour of the Alt+left/right shortcuts for moving between different “fragments” of notes and rests. If you’re not currently using Sibelius and are concerned about converting existing projects from another notation program to Sibelius, or if you routinely work with people using other notation programs, then the improved MusicXML import features in Sibelius 6.1 will be a boon. There are dozens of improvements in MusicXML import alone, including to repeat structures, articulations, dashed/dotted slurs, guitar notations, coloured objects, feathered beams, instrument names, music fonts, and many more. An exhaustive list of all of the changes and improvements in Sibelius 6.1 (which runs to 25 pages!) can be found on the Sibelius web site. It’s also worth noting that the Sibelius documentation has been fully updated with details of all of the changes in Sibelius 6.1, so if you are updating from Sibelius 6.0, choose Help > Documentation > Sibelius 6 Reference to see the latest version of the PDF (which is also available here, together with the updated documentation in all five localized languages). The complete list of changes is organized according to the chapter headings in the Sibelius Reference book, so you can look in the appropriate topic for more details. I installed GPO 4 on Sib 6.0 but did not have much luck trying manual sound sets etc. I installed Sib 6.1 a few days ago. I can see GPO as a sound set but it does NOT say GPO 4 (no 4 anywhere) when I activate the Aria player. No sounds are loaded and when I look at the player (e.g. SHOW in the Playback Device or SHOW from Mixer), the player is empty. NO instruments are loaded and it does not make any sounds. Sibelius Essentials works fine? Are you on Windows or Mac? You should find that you can choose Garritan Personal Orchestra 4.0 from the list of sound sets once you have activated ARIA Player and it appears in the right-hand Active devices list.